I have been on the Mid package for approx 6 months, the first month was hell due to a series of faults on my BT line. After this I had a brilliant connection for around 4 months only the odd occasion of the wireless dropping but apart from that it was a brilliant service. During the past 6 weeks (coincidently since the sky exchange or something went down) I have had a nightmare connecting. Some days are fine but others are terrible. After reading several posts on this forum I have followed a series of advice. I am now connected through the test socket as this seemed to help to begin with, I have also turned off UPnP. It has taken me 2 hours this morning of rebooting the router just to be able to post this message! Just wondering if someone could have a look at the stats below to see if they can spot something that may be causing the bad connection. You're getting lots of errors on your line. have you tried the test socket underneath the bt master socket faceplate? Hi, Yes it has been plugged into the test socket for about 4 weeks. This helped to start with but it has gradually got worse. Just thought I would post my latest stats. I have today spent the over 2 hours on the phone to sky trying to resolve my connection problems. Mananged to get through to a tier 3 engineer only after threatening to leave and asking for a MAC code. The engineer tried many tests and changed various settings and then capped my speed to 2mb. 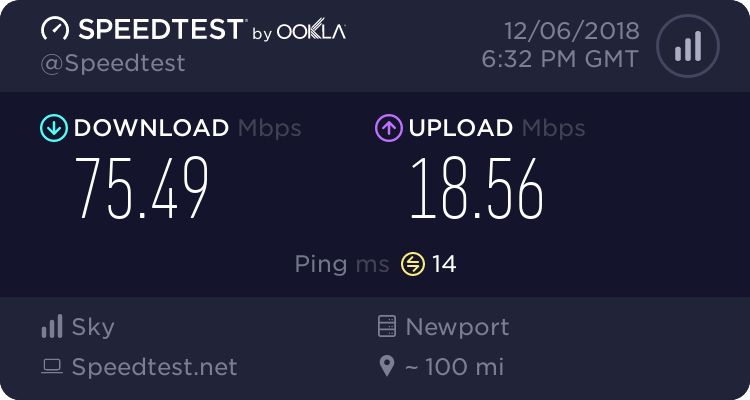 I am still having awful connection problems with my connection failing around 4 times in the past hour. I am now told that I need to get a BT engineer out as the fault could be in the internal wiring. Sky are not prepared to contact BT for me as they say I need to contact them. BT wont talk to me as they say it is a Sky issue. Catch 22!!!!! Now what do I do. Sky have authorised a MAC code for me even though I have only been on the contract for 6 months, should I move back to the faultless service I received at BT or try and resolve this?? Any help or advice would be much appreciated!! If you are definitely plugged into the Test socket then your external line is at fault. Nothing Sky can do about it, but you could try phoning BT and tell them you are hearing noises on your phone line. Don't mention it has anything to do with Broadband. You are not one of the unfortunates who live in an area that has been flooded? If you are this could seriously degrade your connection. Thanks for your replies! No we are not in a flooded area so can't put it down to that. Yes definately plugged into the test socket which seemed to help when I first plugged the router to there but has since got drastically worse. Will try to ring BT tomorrow but not mention broadband, see what they will do then! Hi. dont feel that you are on your own. I have been having the same problems over the last 2 - 3 weeks. It is not as bad as yours but it is just not good enough. What the heck do we do - looking around the net and this forum is probably as good as anything. I spent an hour on the phone to Sky yesterday and the advise they gave was just crap. "Try changing to WEP"
Have you looked at your router info? I found that the downloads were blocked. But creating an Allow did not sort the problem. I have tried rebooting the router in the evening when the loading is high. The idea apparently is that you allow the router to set itself up in the worst conditions - but again the slowing and dropping out still continues. If you find a solution do please post it so we other poor bu---rs can give it a try.